Dealing with multiple stakeholders is a given for any organisation, either operating in the private or public sector. Stakeholder management is a critical component to the successful delivery of any project, programme or activity. A stakeholder is any group or individual who can affect or is affected by the achievement of the organisation’s objectives. Simply put, the main reason for any commercial organisation’s existence is to generate profits for its shareholders (e.g. economic rents). This holds that the strategic aim of a business is to maximise the return of capital for its owners – the dominant stakeholders – who assume risks and deserve rewards as a consequence. However, it is important to consider not only the outcomes, but also the holistic ecosystem which contributes to generating these outcomes. One key question relates to how success is (re)distributed or shared among the various stakeholders, and in that context, who benefits from profit maximisation. Maximising profits does not necessarily mean maximising shareholders’ dividends in the short term, but possibly increasing the value of the organisation, reinvesting into business development and growth – from which the owners / shareholders are likely to benefit in the long term (e.g. through share value increase as a way of measuring profit realisation). Most successful commercial organisations include the notion of value maximisation in their mission statement and are seeking further to achieving normal profits. Shareholders can influence the organisation’s strategy by having profit maximisation as a source of purpose; the stakeholder value perspective challenges the notion of profit. 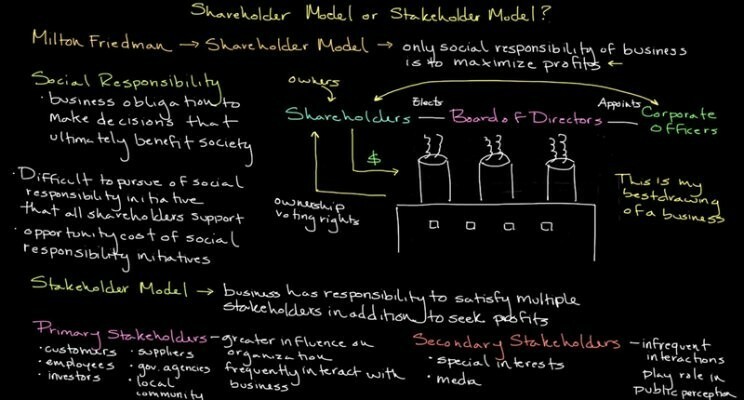 Stakeholder theory asserts that firms should focus on their impact upon a wide range of stakeholders and account for negative externalities arising from their pursuit of profits. Stakeholders can be categorised as external and internal, primary and secondary, those who have to carry out the actions necessitated by the strategy and those who have a stake in the outcome. Shareholder theory advocates that a well-run company that is making money is more likely to treat its employees well and contribute to the local community. It asserts that all stakeholders benefit if for-profit firms pursue a single objective of profit maximisation. Shareholders are a key group of stakeholders – external short or long term investors to the organisations or internal owner-employees. Businesses have responsibility to satisfy multiple stakeholders in addition to seek profits. Making profits do not only concern maximisation for shareholder-investors, neither be at the expense of other key influential stakeholders – this is in the interest of the organisation itself. Some support that it must also be in the interest of the society but this is difficult to generalise for all businesses. Some sort of Corporate Social Responsibility (CSR) – depending of the business – and a clear ethical approach should be defined in order to avoid externalities at the expense of the society. In conclusion, the single-minded pursuit of any objective – whether profit, charitable purpose or protection of the general public’s well-being – will inevitably be in conflict with the objectives of another organisation and/or stakeholder group. Therefore, it is impossible to answer the question “do all stakeholders benefit from profit maximisation” in the affirmative. The reality is that the best an organisation can do is satisfy as many stakeholders as possible most of the time, while pursuing its stated mission and purpose. In the real world of the 21st century, to do so is simply good for business.